In the late 1990s, a gentleman by the name of Nick Swinmurn was looking to buy a specific shoe at a San Francisco mall. He wanted brown Airwalks. After browsing through the mall’s shoe stores he left without finding what he originally came for. In 1999, Swinmurn, along with Tony Hsieh and Alfred Lin, founded Zappos — an online shoe store. By 2008, Zappos surpassed 1 billion in yearly revenue for the first time. Where did Zappos’ success come from? Perhaps it came from the fact that Zappos was able to capture the market during a time when e-commerce was still in its infancy. There were other online shoe stores, though. In fact, many mom-and-pop sellers had already gone online. There was a lot of competition and somehow Zappos was able to beat it. How? Zappos’ idea wasn’t unique. It wasn’t one-of-a-kind. There were others trying to do the same thing. The difference was found in the motivation behind doing it. Zappos entered the market with a unique ‘why’ and that ‘why’ came to define them, and it defines the reason why their customers prefer them over the competition. Zappos’ mantra is: deliver WOW. What does that even mean? Swinmurn envisioned a shoe shopping experience where the customer didn’t have to work to look for what they wanted only to have their expectations dashed when what they wanted wasn’t available. Zappos’ online experience not only made it easier to find what you came for, it also made it more likely that what you came for was available. If Zappos had stopped there, it wouldn’t have become a billion-dollar company. What stops a competitor from copying the same website strategy? Nothing. There is something a competitor can’t copy: the ‘why.’ The internal inspirations for doing what we do. Those are our own. It’s no surprise that Zappos’ ‘why’ was its strongest weapon. If you ask Tony Hsieh — Zappo’s CEO —, the company’s success has more to do with the traditional over-the-phone interactions with their customers. For as much as their business model may seem to revolve around a new digital world, they are 4.5 times more likely to talk to a customer on the phone than through chat and 7.5 times more likely than email. Why would a company built on new technology, in a fast-paced digital age, rely on such a traditional method of communication? Especially today, when most people prefer to text a friend rather than call. When most people prefer to avoid the confrontation. Compare Zappos to, for example, Amazon. Returns on Amazon are automated. You press a button and get a return label. There’s very little interaction with a real person over the phone. Why would you want to call Amazon anyway? The last time I did, I could hardly understand what the customer service rep was saying. I would dread having to call Amazon. Yet, Zappos customers prefer over-the-phone conversations over more “convenient” digital communication channels. It comes down to their ‘why,’ a commitment to deliver WOW. It’s not an end goal, it’s a process, it informs each and everything they do. It drips from their website, their employee culture, and their conversations with clientele. It’s this belief, this ‘why,’ that makes calling Zappos customer service so attractive. It’s this belief, a belief that their customers can identify with, that brings these same customers back — on any given day, roughly 75 percent of all purchases come from returning customers. Without this inner core belief, what would drive Zappos to “surprise”- upgrade most of their customers to overnight shipping? You might say that it drives profits. Sure, so why is nobody else in on this secret? In fact, Zappos reps often drive customers to their competitors. 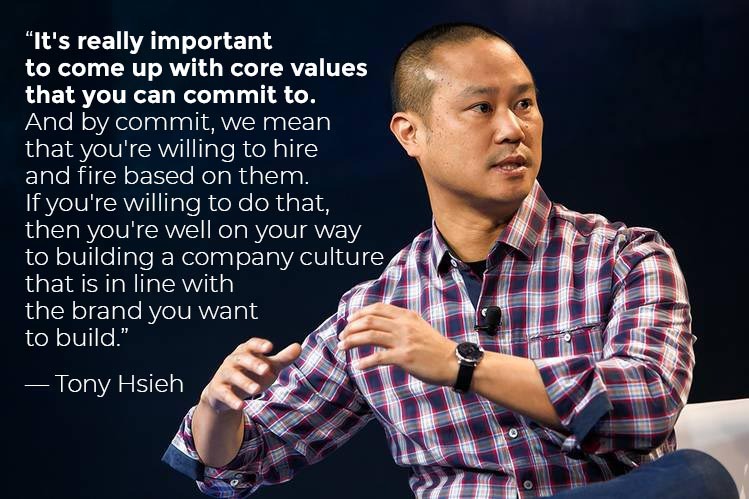 To Zappos, it’s not just about the money, it’s about delivering a certain experience to the customer, an experience that speaks to inner values— it’s evident in everything they do. What’s the lesson in Zappos’ story? People don’t buy what you sell, they buy why you sell it. Zappos’ customers aren’t just buying shoes, shoes that they could just as easily buy elsewhere, they’re buying Zappos’ business philosophy. They’re buying because they identify with the company’s values. That relationship between the values of the business and those of the customer are pivotal. Next time you’re talking with a consultant or a good salesperson, notice how they match the tempo of your speech, your pitch, and even what you say. If you’re in person, notice how they might even match your posture. They do this to provide similarities you can identify with, to build rapport. People like other people who are like them, and if you’re like them in one thing then you must be like them in another. Your ‘why’ makes all the difference and if you truly believe in it, then everything you do — including your marketing — should be built on it. Everything you do should communicate those values. I challenge you to think about your ‘why.’ Why do you get up in the morning to do what you do? What drives you to serve patients or your clientele? Where does your passion come from? There’s no right answer to these questions other than authenticity. Your website content, ad and email copy, the way your staff answers the phone, should all reflect your values and beliefs. People identify with them, they share many of the same ideas, and by communicating that you too hold many of these beliefs you can instantly build rapport with them. Your prospects can feel that you’re someone they can identify with and trust. If you’re being genuine, this shared identity is true and real, isn’t it? By doing business around your core values, you’re inspiring change. Consider that you’re not selling a service or a product, you’re not selling a thing. You’re selling feelings, you’re selling beliefs. If you’re a dentist who sells oral appliances for sleep apnea, remember that your patients can buy the same oral appliance from several different providers. They come to you because they trust you, there is a feeling that you fit the values that they are looking for in a healthcare professional. And if these shared values are authentic, they feel you’re a person they can truly trust. Dr. Jockin has a strong ‘why.’ Her practice is built on strong core values and you can tell, you can get a feeling for them, by the way her patients talk about her. And she was able to find a clever method of communicating these values in a very authentic and real way. What’s your why? And does your marketing reflect it?